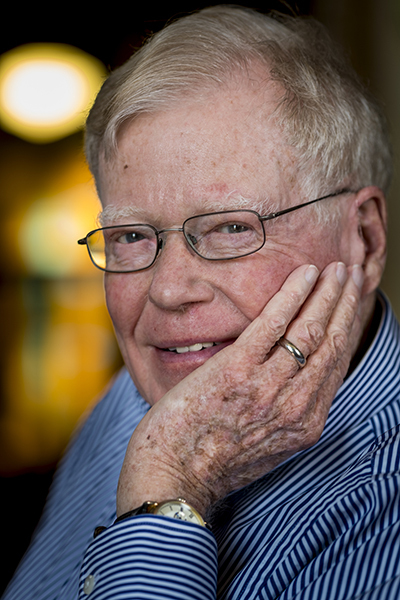 George Drake ’56 has filled many roles at Grinnell: student, athlete, intern, sabbatical replacement, soccer coach (sort of), trustee, College president, and, perhaps most importantly, teacher. As a student, he dreamed of someday teaching at his alma mater. “I thought that would be the pinnacle of life,” he says during a conversation in his office in Harry Hopkins House. At age 83, Drake still teaches at Grinnell and his office shows it. Shelves overflow with books. His desk is not neat. In 1960–61, after his first year at the University of Chicago Theological Seminary, Drake tasted the college teaching life. He organized an internship with Grinnell’s chaplain, Winston King, and taught two history courses for Homer Norton, the College’s British historian, who was on sabbatical. John Pfitsch, athletic director, drafted Drake for an additional duty. Drake smiles at the memory. “So I agreed to do that, but fortunately we had an older Nigerian student named Joe Okumu [’62], who was a great soccer player. I organized the practices and Joe did the coaching. Sue Ratcliff Drake ’58, who taught second grade that year at Cooper School (now a parking lot east of Quadrangle Hall), could see him being a professor. She points out that George was never ordained, though he’s given a number of sermons. “Not that I particularly wanted to marry a minister,” she says with a smile. George Drake returned to the University of Chicago and earned his doctorate in church history, though he wondered what good it would do him in his quest to teach in a liberal arts college. He started as director of the freshman honors program plus some teaching. The teaching responsibilities evolved and a few years later George found himself in the position of dean — without tenure. By then George was serving on Grinnell’s Board of Trustees as an academic voice. Several years later the board offered him the job as Grinnell’s president. George was on the board during A. Richard Turner’s presidency (1975–1979) and saw the problems he had with students and faculty. “When I got the job,” George says, “I thought, What have I done to myself? The word was Grinnell was a graveyard for presidents. Tenure was the only thing he negotiated for when he was offered the presidency, which he left with about 10 years of full-time teaching ahead of him. “I wanted to make it worthwhile,” he says. After George stepped down from the presidency, he and Sue joined the Peace Corps and served two years in Lesotho, a nation encircled by South Africa. George taught English at a girls’ high school and Sue demonstrated teaching techniques to area teachers. By the time Drake returned to Grinnell’s campus, most students didn’t know who he was. “I could make a fresh start,” he says. While still in Africa, George was already thinking about what he would teach when he returned to campus for the fall 1994 semester. His scholarly background in early modern European history and British history — thanks to a year in Paris on a Fulbright scholarship followed by two years at Oxford University on a Rhodes scholarship — overlapped that of two other professors. “But we didn’t have African history then,” he says, “so I realized I could develop a course in southern African history. He had a theme — crisis, liberation, justice, and leadership — but how could he put a course together that wasn’t only Mandela? Inspiration came from an introductory history course he was preparing, Europe to America. “It was English antecedents to developments in American history, regionalism, religion, and constitutional history,” George says. “I had to do a lot of reading in American history and got really interested, particularly in the early national period. Because of that and because a tutorial on this subject ought to include Americans in it, I developed the idea of using Washington and Lincoln. “Going from Washington to Lincoln makes a lot of sense. A lot of coherence there,” George says. He included Mahatma Gandhi and Martin Luther King Jr. too. George doesn’t claim any originality with that assignment. He learned it from Monessa Cummins, associate professor of classics, during a summer seminar for faculty to learn more about teaching writing. “I’d always used shorter papers,” George says, “but I’d never used the one page and she convinced me of the advantages. It poses a huge challenge to the student — how can you say something meaningful in one page? Plus, it’s close to what you’ll be doing in life when you’re writing. “It’s manageable from the faculty point of view to move from craft to final paper with a meeting with every student. Those meetings last 10 or 15 minutes. They’re not very long. You can accomplish quite a bit. “Plus you can take sentences apart. You can take paragraphs apart, because it’s a short assignment. So you really can focus on structure and grammar and things like that, as well, obviously, as organization and argument. It’s the best thing I’ve ever found for the teaching of writing,” he says. It’s not just students who appreciate his teaching abilities. Ellen Mease, associate professor of theatre and dance, team-taught Humanities 140: Medieval/Renaissance Culture 1100-1650 with George at least three different times. “The advantage of team-teaching, I think,” she says, “is I get to hear how a professional historian goes about providing the sociopolitical and the cultural context for the close study of the selected text that we’re working with. “He would describe, for instance, the development of the most sophisticated armed weapon of the period, the knight, in terms of the expense that it takes to develop and deploy a stealth bomber. He’d talk about all the equipment that you needed as a knight — the squire, the armorer, the guy who’s going to repair, the guy who’s going to shoe, the horse, the technological development of the stirrup. You can’t stay on your horse in heavy armor unless you have a stirrup that allows you to balance. That’s the kind of detail that students don’t forget. “So here’s the other advantage of team-teaching, especially with George,” Mease adds, “being able to, both of us, evaluate student papers and to look at the utter simplicity of George’s ‘This could be clearer’ written neatly in the margin. He’s not telling the student how to rewrite the sentence. Another component of George’s approach to teaching writing is the use of tutorials. These stem from his two years at Oxford University on a Rhodes scholarship before he went to seminary. So George continues to learn about teaching. During the last faculty writing seminar he attended, he explained to his fellow participants why he was there. 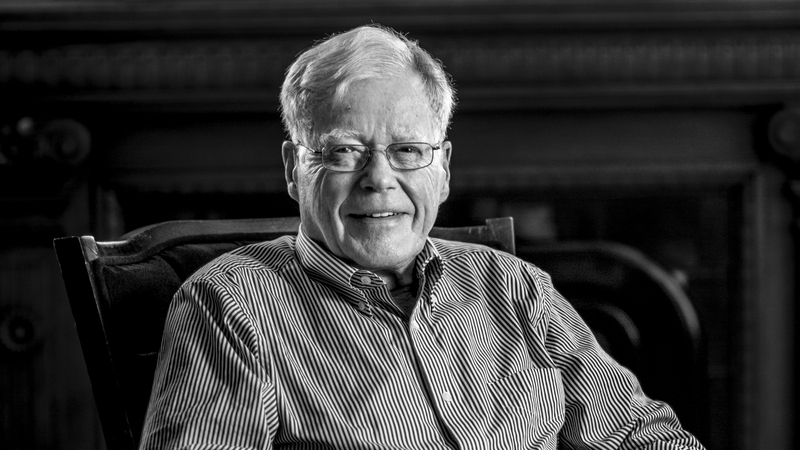 “When I was president, we instituted the SFS [senior faculty status] program as we wanted to phase people into retirement and then get them to retire, because we didn’t want a lot of 80-year-olds doddering around here trying to teach. Well, I’m 80 years old and I’m doddering around and I’m trying to teach, so I better do seminars and try and improve myself.” He smiles at the retelling. Sue, his wife of 57 years, had a lot of influence on him as a teacher too. She taught grades two and three for several years, including some of the hardest teaching of all — substitute teaching. She served as a model for him.